Fasten your seat belt, a clever new watch is coming! This is not their first collection but this one is special because it could revolutionize the watch industry, so we would like to share it with you as soon as possible. It took them almost 2 years to design Origin, a classic mechanical watch that features an interchangeable slim strap with embedded electronics for adding fitness and intelligence to timekeeping. When modern tech meets traditional watchmaking, the Origin by Grayton is born! 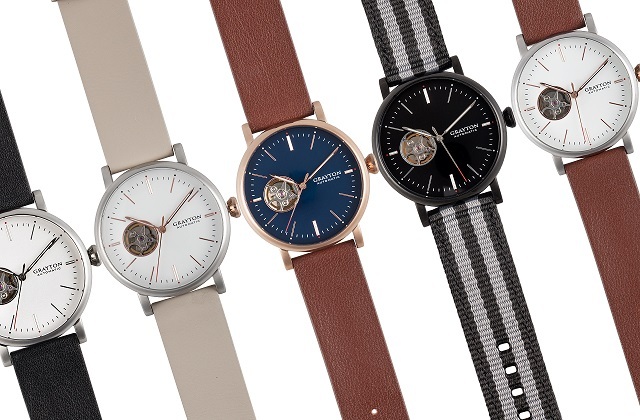 Grayton introduces the Origin Mechanical watch: a classic self-winding timepiece with open-heart design plus a smart strap for activity tracking, phone notifications, music control and more. Technology evolves but style is timeless As boutique watch makers, Grayton understands that there is no substitute for a beautifully designed and handcrafted automatic watch. 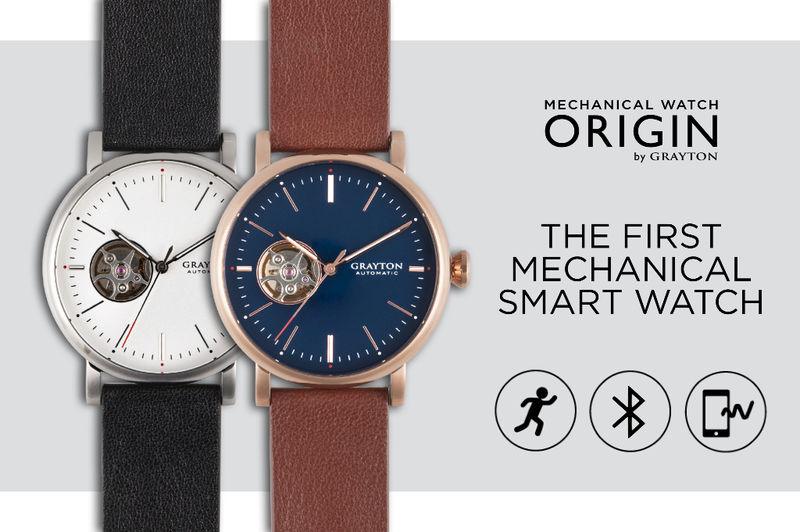 The Origin Mechanical watch represents the perfect marriage of sophistication and smarts - the natural evolution of Intelligent Timepieces for a connected world. Origin was designed to deliver the best of watchmaking and technology – a mechanical watch with a classic design and embedded electronics hidden in its leather strap that add convenient smart features. The Origin is finely crafted to exacting standards in a brushed 316L stainless steel case with polished accents. The open-heart dial and see-through back cover puts Origin’s intricate selfwinding mechanism on display, and keeps Origin infinitely wound. Its Japanese movement has 26,100 beats per hour and 24 jewels for superior timekeeping accuracy and a power reserve of 41 hours between wearings. What makes Origin special, among other things, is the independent strap which instantly adds smart features. Designed to perfectly complement the Origin, the strap is refined, comfortable and slim. The smart strap is virtually indistinguishable from the best traditional leather straps of other fine watchmakers. “Fitness trackers are popular because they are affordable and offer useful functions. But they feel cheap, are often uncomfortable and become obsolete quickly. We are living in a new era where timepieces meet fashion and technology and there is no turning back! 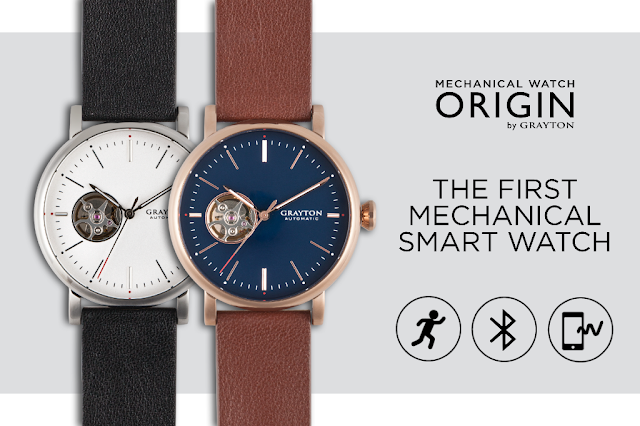 Origin is the first Mechanical watch that has connected features built directly into a classic leather smart strap. Now, people don’t have to choose between beauty and convenience” Sébastien Druvent, Product Marketing Advisor. 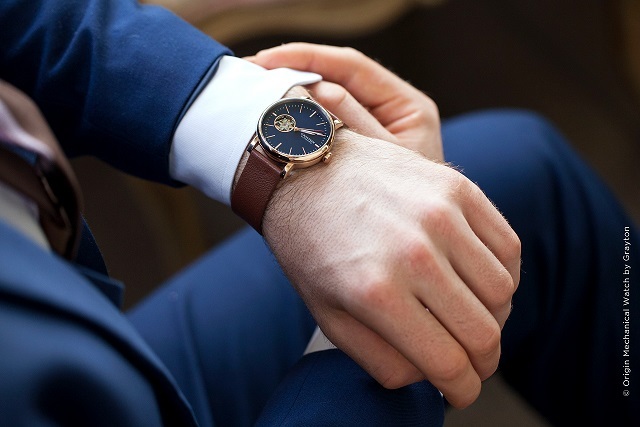 This revolutionary watch connects to a smartphone for the most convenient features such as calendar reminder, alarms, phone notifications and more. The built-in battery allows up to 10 days of autonomy between charges. 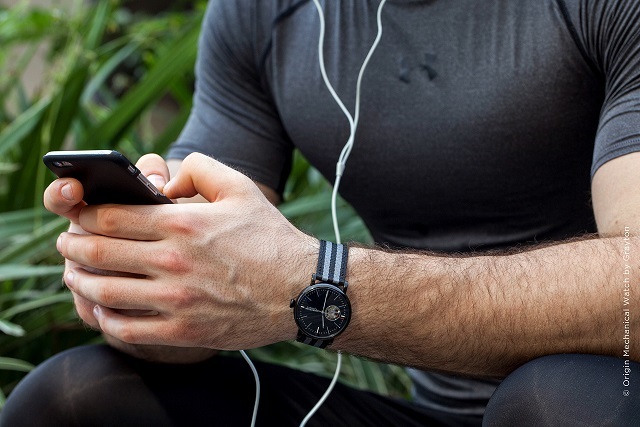 It’s ideal for receiving notification alerts in the office or recording workout fitness data at the gym. The Origin and the accompanying Grayton app are compatible with both iPhone and Android phones. For people that already have a watch that they love, the Grayton smart strap is interchangeable with standard watch straps to easily add fitness and intelligence to any watch from Daniel Wellington® to Patek Philippe®. 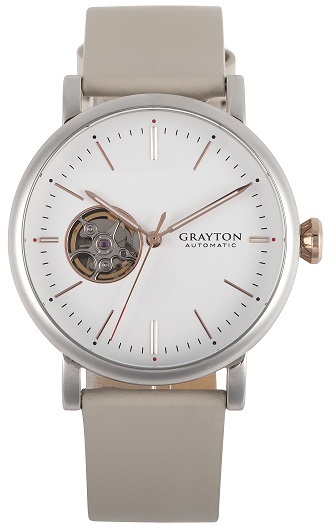 Grayton has raised the bar on what a classic watch can do. With Origin, fashion, technology and convenience coexist perfectly in a stunning timepiece for any occasion. 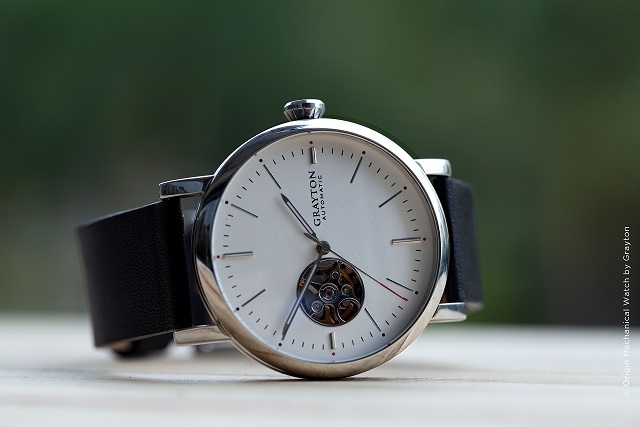 We hope that you have enjoyed learning about this new mechanical smart watch. You may also have interest in viewing our fitness watches section which discusses fitness trackers and other sorts of wearable technology. You may also be interested in viewing the wearable tech term in our fashion terminology section.